What we called modifiers are now "resonances"
Flawless Ivory Horn has a Brass Resonance of 11 (110%). Can someone please upload a screenshot with the updated display? Follow the "Add Image" link above, then post here when you're done. Increase my brass skill with DDD with this instrument. Aye it truely has been changed to Brass, much to my upset! I was in a situation that needed me to invis my group through some hiary places and was locked down because I now had 2 brass instruments but no wind. Kinda a screwed up thing for them to do! There is another horn that drops off the swarmers that is primary equippable, I believe it is just labeled Ivory Horn, but is primary equippable and a wind instrument, after about 20 minutes killing swarmers you should loot at least one of the two horns, they're fairly common. Skill raises on the these instruments seem to be broken but they do allow you to equip a weapon while using them and they allow you to use brass or wind instrument songs while wielding a weapon, I'd just use a flute or a horn to raise skill in those till you master them. Just so you everyone knows, after testing on my bard, I couldnt get skill gains with either this one or the wind one IN MY PRIMARY, once I switched either instrument over to secondary skill ups came as would with any other normal instrument. Just started using this to raise brass skill up and skills have been going up fairly good.. 15 skill ups in 30 mins.. anyone know what stat helps skill ups go faster for bards?? when i equip it, it does not play like other wind instruments. i just hold it and it does not move as if i were blowing into it. also my skill does not go up when using it either. My Vah Shir Bard dinged 16 today and shortly there after memmed Tarew's Aquatic Ayre. He whipped out the Flawless Ivory Horn he had been carying around for 12 or 13 lvls and after several missed notes the song fired up and a few minutes later I got the message "You have become better at Singing! (81)" !!! A trip to the instrument vendor later, he equipped a flute and his wind skill is now going up. It doesn't matter which slot this horn is equipped in, it will not work as a wind instrument. Anyone else having this problem? I've had the same problem with this one on my bard. It works fine with the songs that require the wind instrument, but it doesn't seem to increase your skill. As soon as I equipped her wooden flute (always handy to keep a spare in the bank for those nasty corpse runs), her skill went up. Hopefully, it'll be working properly soon. It works just fine with Shauri's Sonorous Clouding, which required a Wind Instrument....didn't matter which hand it was in, either. However, looking from third person, it doesn't look like I'm playing it. Finally able to hold instrument in primary hand! 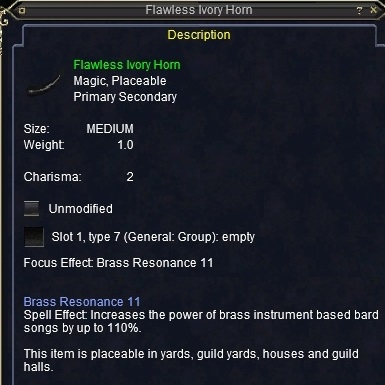 The most amazing feature of this horn from a bard's point of view is that it is equippable and PLAYABLE in the Primary slot. It is the only instrument I have ever seen that allows you to equip a shield or weapon in the secondary slot while holding an instrument. However, I cannot equip any of my other instruments in the secondary slot while holding this in the primary. RE: Finally able to hold instrument in primary hand! But then unluckily you won`t attack with the primary hand which would usually be a hand to hand attack. It�s still nice to have because you can put another stat item in the secondary slot. My Shammie's gotten 3 of these and my Warrior 2 off of the Swarmers. They are rare, but not that rare. #aoeinOwnzjOO, Posted: Jan 13 2002 at 9:13 PM, Rating: Sub-Default, (Expand Post) Hmm seems i can play instruments now.../shrug they need to nerf the classes that can use to bard only since they are the only ones that use instruments. are the other classes able to use the CHR +2 ? Yes, My kitties get the +2 Char and a discount (~2%) at the merchants while holding it. I killed a mob that dropped this. It was a Ch'thk Swarmer in Shadeweaver's Thicket. Didn't have a bard so sold to some dude for 25pp. Note that the Ch'Thk Swarmer is like level 3 or 4. Yellow to my level 2 BST. Seems to be a rare drop. Note that pre-patch these were NOT equipable. I'm not sure whether the patch was retroactive but I would guess so. I just hope the guy that bought it held on to it until the patch a few days later! The beetles also drop cracked ivory horns, which I assume are worse than this. Anybody know what mob drops this in Shadeweavers? It's the giant ash beetle, you can find it around the outside opening to the cave of the paludal caverns, or these beetles usually randomly spawn around charred corpses or firefall saureks areas. I'm not sure how often these things drop. (it took me about 3 kills to get one, I killed about 10 after that and didn't get another). Bard of the 26th season.